That is something I've said entirely too often, so I made an addon to help! Can I Horn is a warhorn tracker addon that is simple, and tells you what you need to know with a quick glance! No trying to read a small timer or find the buff in a bunch of others.. just quickly glance at the colour! Green text reads "Warhorn not active" when it's safe to horn.. because there is no warhorn active! Upon warhorn activation, text will change to "Warhorn Active" in red. Don't warhorn during red! If the warhorn was Aggressive Horn, the text will turn yellow once Major Force drops. It may be safe to warhorn if there are a few up! Text only changes if the person who blew the horn, or someone who received it, is in support range. (People in support range show as lit up in group frame area) - Helpful for cases like Hel Ra, where you don't care about the other group when split up. Text font, colour, size and outline are all customizable per warhorn state! I wanted a warhorn tracker I could use as a healer - green for go, red for stop. Then I wanted one I could use as a DPS - to time my ultimates better. As I lead raids, this became invaluable as I could call out warhorns more efficiently. 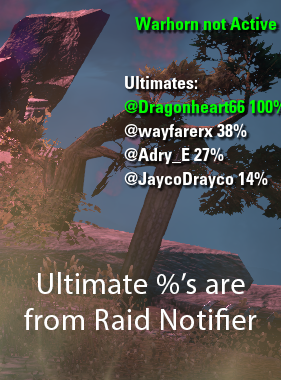 I recommend you use an ultimate tracker such as the one built into Raid Notifier. These are planned features. I don't know when or if they will make it in, but I'll try! 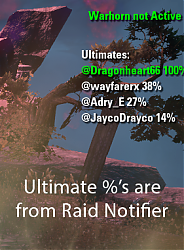 Healer/Tank mode where the word only appears when no warhorn is active, and you have enough ultimate. What is "Support Range Only"? Take a look at your group frame when in a group. When someone is too far away from you (or possibly in a different zone) they will appear faded. Anyone who appears faded is outside of your support range. When you have "Support Range Only" turned on, the addon will only change if someone who is within your support range receives the warhorn buff. -Text can now be locked in place! -bugfix for horns not being seen until you changed a setting. Hopefully. -Support Range Only is now an optional, default on. -Indicator now hides when it's not needed. -MOAR SETTINGS! Now you can change the font, size and outline of each warhorn state. -Corrected version in addon to match proper ESOui version. -Streamlined some code to help better support new features and easier debugging. -Added a changelog to chat upon first login at update for any big news. -WE HAVE SETTINGS! Added font colour options for all warhorn states. No reloadui needed when changing colours. -Updated API for Wolfhunter PTS. We are no longer out of date! -Addon now only changes text if the person who blew the horn (or someone receives it) that is in support range. If someone is lit up in the groupframe that means they are in support range. I get an error most frequently in Depths of Malatar when group gets ported to final realm, but it seems that it can sometimes happen after going through a door between zones. It might have something to do with if an enemy is engaged when you go through the door because there are some doors I have 0 problems with while the final port section of DoM is always an issue. Most recently in WGT, the only door that caused the error (of the many in there) was after someone had engaged the spider daedra on the other side before I made it through. This error should have been fixed in the latest release. Possibly just need to update your addon. Thanks so much for your work on this addon. One small thing: I noticed when I downloaded the new version from Minion this morning that the files were unpacked directly into my addons folder. So instead of Documents > Elder Scrolls Online > Live > Addons > Can I Horn, all the lua files were just plopped directly into the Addons folder, without their own directory. This will probably cause the addon to not work. I fixed it by just creating a directory in the addons folder from scratch and dropping the Can I Horn? files in it. Yup you are right. I zipped the filed instead of zipping the folder! Just uploaded a properly zipper version. Like the poster before me, I also would prefer the warhorn tracker to only show when in combat. Although it's only one line of text, I don't think its necessary to have on your screen when idling in town or hunting shards (for example). My only other request would be to allow us to lock the position of the text once we've found a place to place it. As it is, I moved it near my action bars but I don't want to move it again by accident. Am back to working on this addon now so will try implementing this again! Would be nice to implement an option so the tracker does not show when you're not in a group, or maybe not in a dungeon / trial. Also I miss being able to prepare to horn in some trials, could you add a counter? It either switches around (first major force then warhorn) or 2 sepearte numbers? Last edited by wambo : 11/28/18 at 05:32 PM.